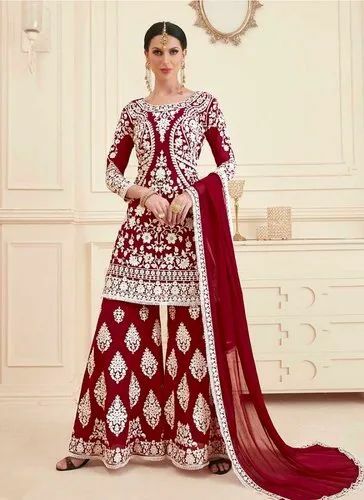 Offering you a complete choice of products which include designer sharara salwar suit, new colors sharara suits, pakistani style designer sharara salwar suit, designer gota patti work sharara salwar suits, exclusive designs upada silk sharara salwar suit and wedding wear heavy embroidery work sharara suit. Designer Sharara Suits Catalog Have FAUX GEORGETTE Top With Embroidery Work.Its Comes With GEORGETTE Bottom and NAZNEEN Dupatta. Designer Sharara Suits Catalog Have VISCOSE UPADA SILK Top With Embroidery Work.Its Comes With GEORGETTE Bottom and NET Dupatta. Designer Sharara Suits Catalog Have FAUX GEORGETTE Top With Embroidery Work.Its Comes With SANTOON Bottom and NAZNEEN Dupatta. Designer Sharara Suits Catalog Have FAUX GEORGETTE Top With Gota Patti Work.Its Comes With GEORGETTE Bottom and CHIFFON Dupatta. Designer Sharara Suits Catalog Have UPADA SILK Fabric With Embroidery Work Top.Its Comes With GEORGETTE Bottom and NET Dupatta. Designer Sharara Suits Catalog Have FAUX GEORGETTE Fabric With Embroidery Work Top.Its Comes With GEORGETTE Bottom and CHIFFON Dupatta. Sharara Suits Catalog Have GEORGETTE SATIN Fabric With Embroidery Work Top.Its Comes With GEORGETTE Bottom and NET Dupatta. Sharara Suits Catalog Have FAUX GEORGETTE Fabric With Embroidery Work Top.Its Comes With FAUX GEORGETTE Bottom and GEORGETTE ORGANZA Dupatta. Sharara Salwar Suits Catalog Have Pure Georgette Fabric With Embroidery Work Top.Its Comes With GEORGETTE Bottom and NET Dupatta. ~Custom Stitching Available,You Can Customize Your Size as Per Your Requirement. ***ShararaSharara Salwar Suits Catalog Have FANCY Fabric With Embroidery Work Top.Its Comes With FANCY Bottom and FANCY Dupatta. Sharara Salwar Suits Catalog Have GEORGETTE Fabric With Embroidery Work Top.Its Comes With GEORGETTE Bottom and NAZNEEN Dupatta. Sharara Salwar Suits Catalog Have GEORGETTE SATIN Fabric With Embroidery Work Top.Its Comes With GEORGETTE SATIN Bottom and CHINNON Dupatta. ~You Can Buy Singles And Full Set Both. Phillauri Vol - 15 Salwar Suits Catalog Have GEORGETTE Fabric With RESHAM Work Top.Its Comes With GEORGETTE Bottom and SATIN Dupatta. Shamita Shetty Special Sharara Suits Catalog Have GEORGETTE Fabric With Embroidery Work Top.Its Comes With GEORGETTE Bottom and GEORGETTE Dupatta. Sharara Suits Catalog Have GEORGETTE SATIN Fabric With Embroidery Work Top.Its Comes With GEORGETTE Bottom and GEORGETTE Dupatta. Kids Sharara Suits Catalog Have GEORGETTE Fabric With Embroidery Work Top.Its Comes With GEORGETTE Bottom and GEORGETTE Dupatta. Sharara Suits Catalog Have GEORGETTE Fabric With Embroidery Work Top.Its Comes With GEORGETTE Bottom and GEORGETTE Dupatta. Sharara Suits Catalog Have NET Fabric With Embroidery Work Top.Its Comes With SANTOON Bottom and NET Dupatta. Designer Sharara Suits Catalog Have VISCOSE UPADA SILK Fabric With Embroidery Work Top.Its Comes With GEORGETTE Bottom and NET Dupatta. Wedding Wear Sharara Suits Catalog Have GEORGETTE SATIN Fabric With Embroidery Work Top.Its Comes With GEORGETTE Bottom and GEORGETTE Dupatta. Pakistani Style Sharara Suits Catalog Have SILK Fabric With Embroidery Work Top.Its Comes With SANTOON Bottom and BEMBERG Dupatta. Celebrity Style Suits Catalog Have GEORGETTE SATIN Fabric With Embroidery Work Top.Its Comes With GEORGETTE Bottom and GEORGETTE Dupatta. Sharara Suits Catalog Have GEORGETTE Fabric With Embroidery Work Top.Its Comes With GEORGETTE Bottom and NET Dupatta. Party Wear Sharara Suits Catalog Have GEORGETTE Fabric With Embroidery Work Top.Its Comes With NET Bottom and NET Dupatta. Sharara Suits Catalog Have GEORGETTE Fabric With Embroidery Work Top.Its Comes With GEORGETTE Bottom and CHIFFON Dupatta.